The North Auckland Research Centre is hosting an exhibition of bookplates at the Takapuna Library in the Angela Morton Art History Reading Room. The exhibition is open during library hours through until Sunday 12 July. The Angela Morton Reading Room is a very appropriate venue for this exhibition as bookplates straddle the worlds of art and literature. 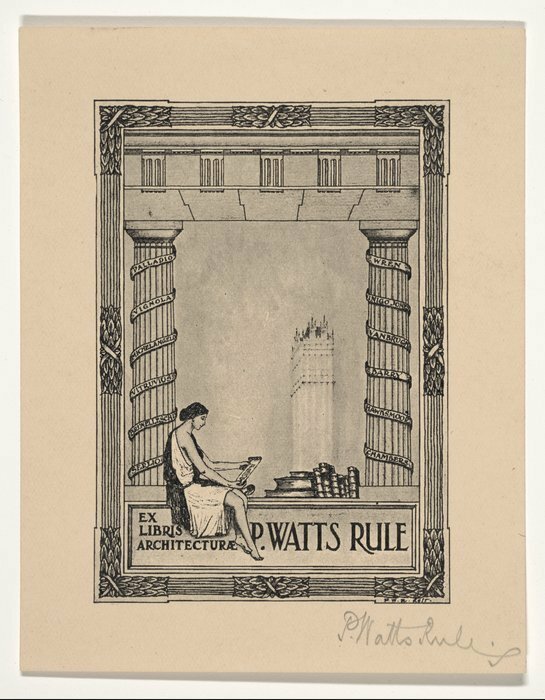 Ref: Rule, Percival Watts,1889-1953. 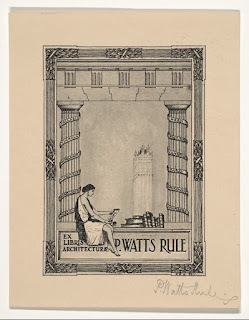 Rule, Percival Watts, 1889-1953 :Ex libris architecturae P WattsRule. P.W.R. delt. [1930s?]. Ref: A-136-019. Alexander Turnbull Library,Wellington, New Zealand. This exhibition draws on the extensive book plate collections of members of the Auckland Ex Libris Society, the only such group in New Zealand. According to Thwaites the Auckland Ex Libris Society started life as the Auckland Branch of the New Zealand Ex Libris Society on 27 November 1930 and that members of the Quoin Club helped to supply some of the members of the new Ex Libris Society. It remains the only active bookplate organisation in the country, and has held meetings regularly since 1930 except for a gap between July 1943 and August 1946. This year marks 85 years of existence for the Auckland Ex Libris Society. The 1920s-1940s was when bookplates were fashionable in this country. 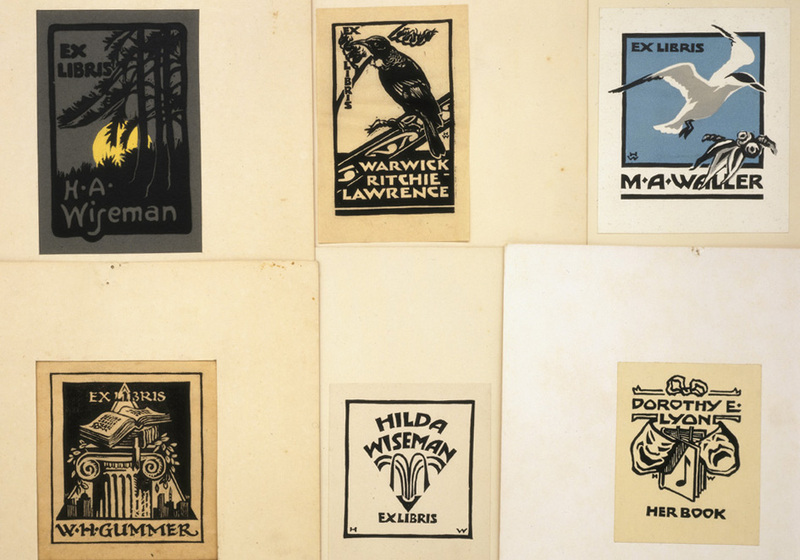 Hilda Wiseman was the most influential figure in the New Zealand bookplate movement and in addition to her own output, she encouraged other bookplate designers and collectors. From the inaugural meeting of the Auckland Branch of the New Zealand Ex Libris Society on 27 November 1930, Hilda Wiseman was its mainspring. With only very few interruptions for illness, she was Honorary Secretary from 1930 until 1967 (Thwaites p.83). However it is her achievement as a bookplate designer which is outstanding (Thwaites, p.84). In 1979 her collection of several hundred plates was presented to, what was then, the Auckland Public Library. The collection in the library includes bookplates that belonged to some famous and also some rather infamous individuals including: Captain James Cook, Vladimir Ilyich Lenin, Adolf Hitler and George Washington. Auckland Libraries also holds Wiseman’s artistic papers as part of our New Zealand Manuscripts collection, which includes original ink sketches for her bookplates as well as some paintings and her easel. Ref: Hilda Wiseman, Bookplates, 1925-1965, Sir George GreySpecial Collections, Auckland Libraries, 7-C1917. This image is showing six bookplates created by Hilda Wiseman for herself, for Auckland architect William Henry Gummer, for bird-lover M. A. Waller, Warwick Ritchie Lawrence and for Dorothy Lyon, a long-serving and much-loved member of the Library’s staff. Auckland’s other large public bookplate collection is held in the Auckland War Memorial Museum Library. You can read about some of the bookplates at the Hocken Library here. Ian Snowden wrote about an interesting one he found whilst cataloguing in Sir George Grey Special Collections. For the centenary commemorations of Anzac Day this year, Ian Thwaites wrote a wonderfully illustrated article by on Anzac bookplates. I've updated the link now, thanks very much for letting us know.